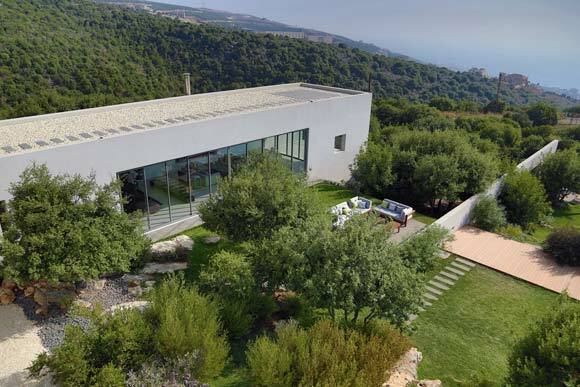 The residence is located in Batroun, 50km north of Beirut, Lebanon, in the vicinity of this ancient coastal town that is quite representative of the traditional regional architecture. Positioned on a hill overlooking the shoreline and the old city, the site is a typical Mediterranean natural environment. 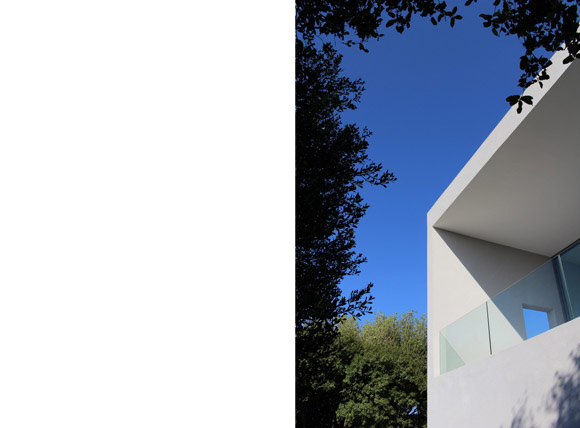 The design of this family house was hence the opportunity to rediscover the revitalizing relationship living spaces can share with nature and the subtle dialogue architecture can have with a landscape. 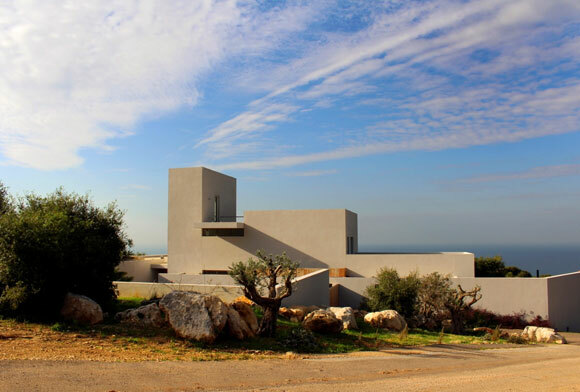 It was less about building a house than inhabiting nature and fundamentally about the contemporary reinterpretation of the traditional domestic architecture by ultimately doing justice to the site and to the Mediterranean spirit. 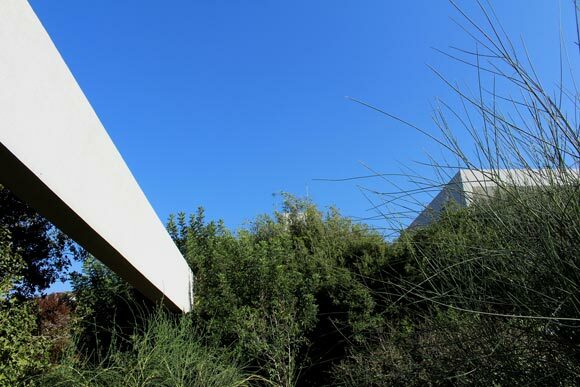 The challenge was not only to preserve the existing landmarks and highlights but also to capture the place’s pervading spirit; because we believe that the utmost value of a piece of architecture within a landscape is to unveil the site’s genius loci. Following a meticulous site survey, we have first outlined a potential area of intervention that would minimize the impact on the environment and make the most of the existing conditions. 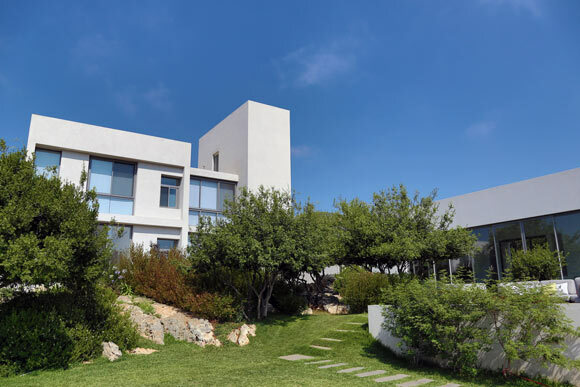 The design intent was to maximize the outdoor spaces, to get the best vantage points, to enjoy the spectacular sunsets, to initiate interactions between the house’s entities, but also to accommodate the specific dynamics of the family while offering privacy for each of its members. 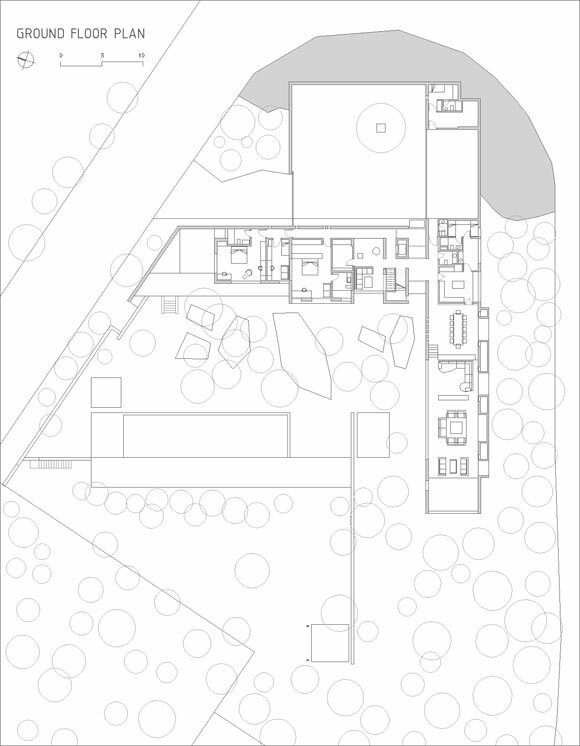 The residence is structured into two main entities drawing a T shape plan and connected by the entrance; the latter is hence always a transitional space from a sequential point of view. The first entity is a single-storey 6.6m wide and 52m long rectangular box that includes the indoor parking, the services facilities and a single expansive space on a split level containing the dining and the reception areas that extends to a covered terrace. 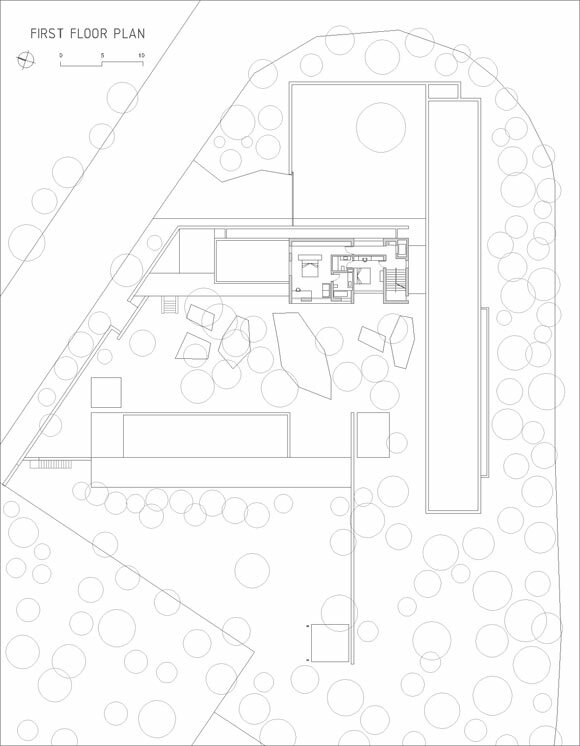 The second entity develops partly on two storeys and is dedicated to the bedrooms. 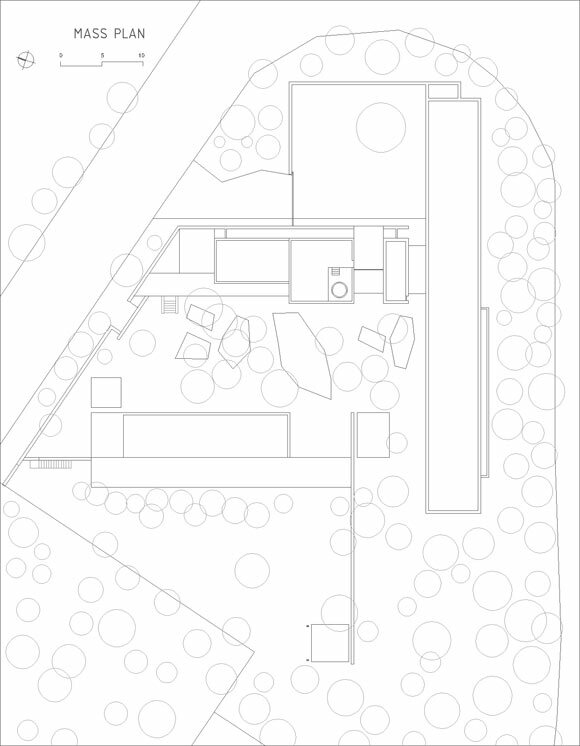 The T shape layout defines two distinctive and contrasted outdoor spaces. On the east side, the mostly mineral courtyard generated by an excavation in the site becomes the opening sequence by which one accesses the residence. 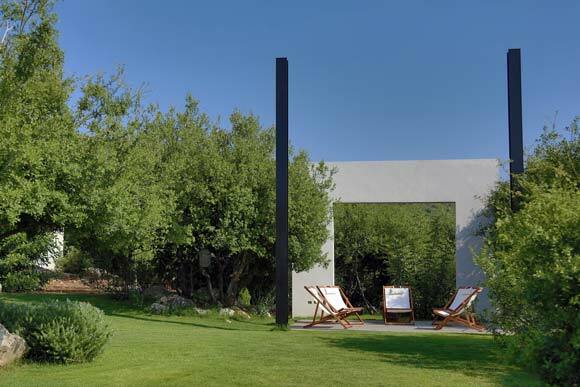 On the west side, a landscaped garden expands within the untamed nature and gently adapts to the site’s natural slope. 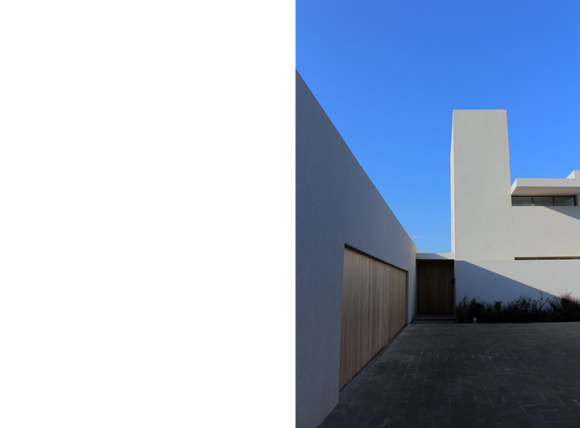 In contrast with minimal openings onto the courtyard, the residence opens up with floor-to ceiling and panoramic openings on the gardens initiating a dynamic dialogue between the indoor spaces and the scenery. 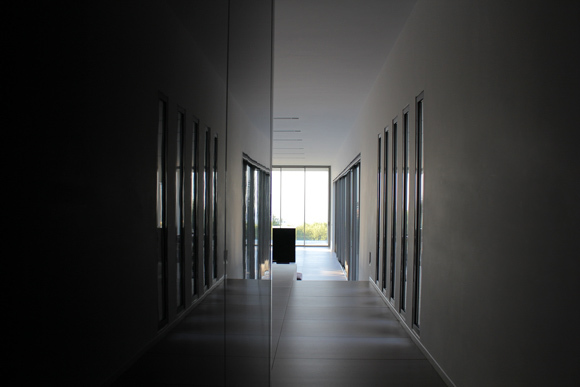 These openings shift the perception between the exposure to the raw elements of nature when open, and the consistency of an architectonic enclosure when closed. 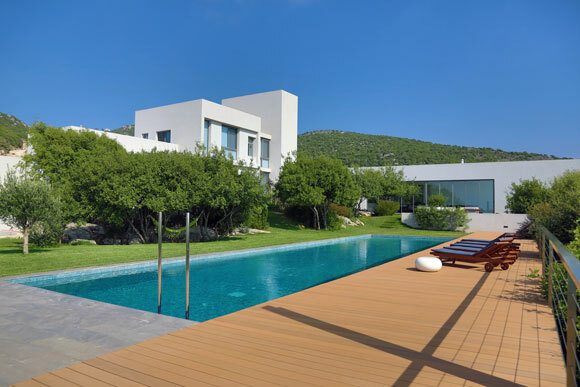 All spaces on the ground floor benefit from views and direct accesses to the garden while those on the first floor enjoy terraces and panoramic sea views. 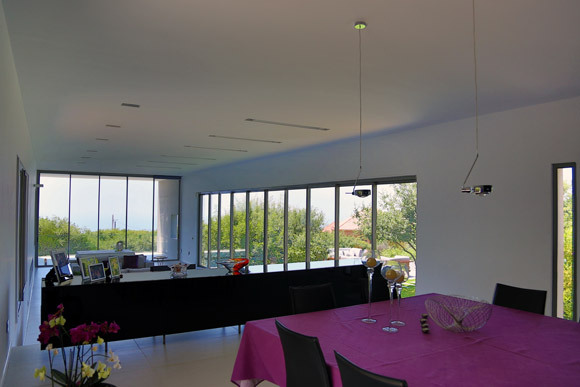 At all levels, the outdoor extensions allow various experiences of the exteriors and a soft transition from private to semi-private areas. The outdoor spaces are organized on three main levels. The upper level is the direct extension of the reception area. 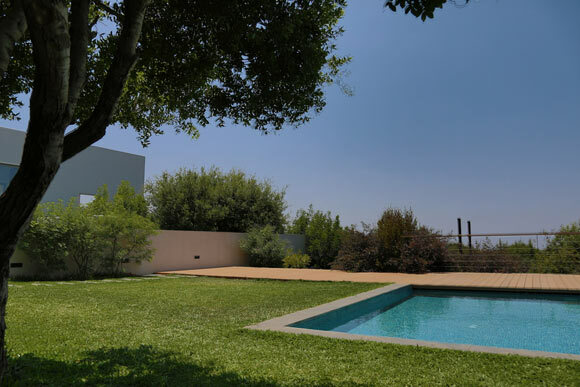 The mid-level includes a pool alongside a wooden deck; both strict rectangular entities of dynamic proportions initiate a dialogue with the architectural language of the house and face the distant horizon as well. The lowest level connects in parallel to the other garden areas ensuring a continuous outdoor promenade. Finally, a 30m long architectonic element concludes the overall scheme by connecting the house and the gardens; framing the views and staging the outdoor spatial sequences, the extensive portico draws the final touch to link the architecture and the landscape. 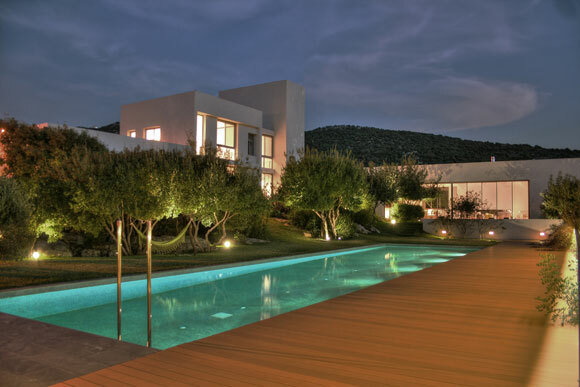 Distilled to its essence, the house represents a minimalist expression of timeless architecture delicately placed within the context of an informally landscaped garden and a spontaneous nature, creating a pure harmonic balance between the man-made simple geometric forms and the organic landscape surrounding it. Alternately, architecture and landscape unfold as mutual backgrounds and foregrounds, in a vibrant spatial scenography. 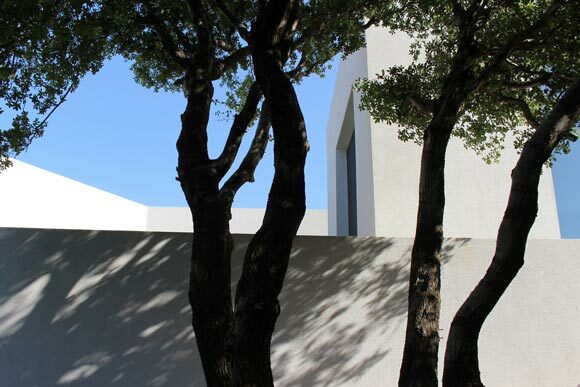 As in contrapuntal composition, architecture develops here its own theme in harmony with the melody of nature. It might at some point perform its own cadenza but it is definitely seeking the right tone, arrangement and orchestration for the perfect concerto. Carlos Moubarak studied Architecture at the Académie Libanaise des Beaux-Arts (ALBA) in Beirut, Lebanon. His diploma project was awarded with honours and multiple distinctions including the School of Architecture 1st prize and was the prize-winner of the Chaderji Foundation Award 2002, the national prize for the year’s best graduation project. 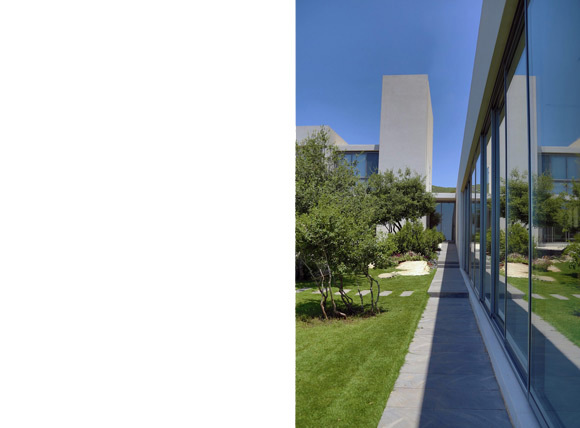 Following several collaborations with local and international practices, he established carlos moubarak architect in Beirut, Lebanon in 2007. Alongside his architectural praxis, Carlos Moubarak combines academic work as he teaches architectural design studio at ALBA since 2007. A fine piece of architecture! I am sure this will be one of the many excellent works to come!